"There's a problem with your API key". This generally means that your OptimizePress installation was not able to reach our licensing server. This could happen for several reasons, but usually waiting a few minutes and then clicking the green "Save Settings" button at the bottom of the OptimizePress > Global Settings screen can fix this issue (this will recheck your API key with our server). Also, make sure that you ONLY copy the API key and not any trailing spaces or the word "valid" at the right side as that would break the API key from working. Please login to https://members.optimizepress.com/ and click on the licensing tab on the top menu. Please verify that the key entered on your site matches a key on the licensing page. While logged into the licensing area of members.optimizepress.com: The site URL would also need to match. Make sure the URL on the right side of the license key is the same as the "Site Address (URL)" found under the WordPress Dashboard's "Settings" and "General" area. If the site URL does not match, then click the " clear" link to the right of the site url in the licensing area of members.optimizepress.com to reset the key, and then click the "Save Settings" button again on your site in the OptimizePress > Global Settings screen to re-assign the site to the API key. Please note that if you accidentally used an API key that is already in use, you might want to just copy and paste a new API key into the API field under Global Settings in OptimizePress. NOTE: You can not use the same API key on multiple sites. Each site must use it's own unique API key for the licensing page of your site. If all this matches and you are still having problems getting this message, then please verify with your web hosting company that they are not blocking communications with a firewall or other means. The domain for our server is optimizehub.com /members.optimizepress.com.. Please ask your hosting company to whitelist all HTTP communications and you should then have no further issues. Please note that if your server administrator or hosting company does not properly whitelist our server IP addresses you will still have issues so you need to ensure this has been completed. In some instances of our users having trouble licensing sites, we have found the issue can be that the connection timeout time on your server is set to a too low number and your server is not waiting long enough to receive the confirmation of the license from our server (this process only takes a few seconds). In instances such as this - you should contact your host and ask them to increase the HTTP timeout time which should help prevent this issue. You can check this by going to OptimizePress > Dashboard > Compatibility > and look for the "Connection with OptimizePress Security & Licensing service is in order". This must be green (as shown below). If you see a red box here, you must check the above sections (including HTTP timeout and server connection) as one of these things is not correct. Once you activate an API key for a site, the only way to reset it for use on another site would be to login to members.optimizepress.com and "clear" the key. This is because the API server locks in that URL to that API key. Uninstalling OptimizePress does not automatically reset this, so you would likely get an error message about the API key if you try to use it on another URL without first resetting it. To reset your API Key, please login to https://members.optimizepress.com/ and click on "licensing" at the top of the page. Then, on the next page you'll see a list of API keys. You can find the URL of the site it was previously installed on, and then simply click the "clear" link to the right of the URL to reset the API key to be able to use it again on another site. 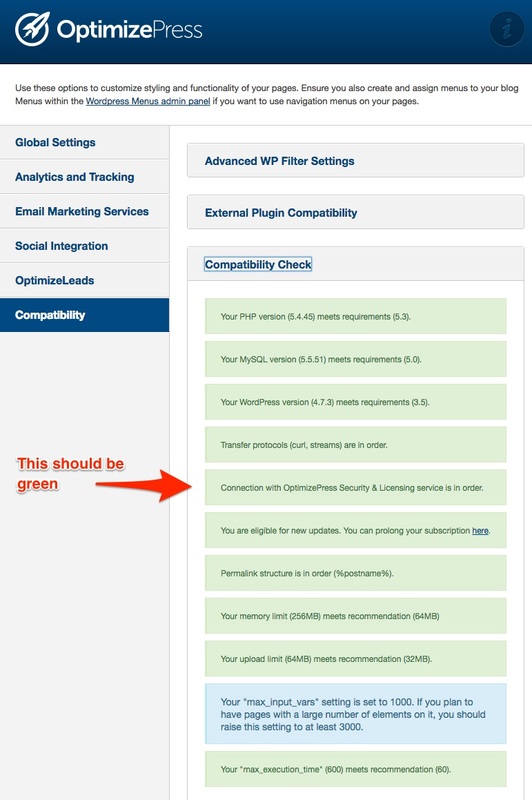 If you do use it before resetting it, you can follow the procedure above to reset it, and then log back into your WP Dashboard, and click on "OptimizePress" and just click the green "Save Settings" button at the very bottom, and that should re-activate the API for that site.